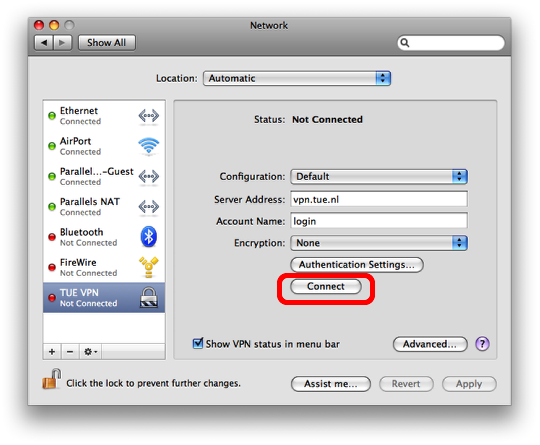 Connecting to the TU/e via a Virtual Private Network (VPN) with Mac OS X 10.5 (Leopard) | Christoph Bartneck, Ph.D. If you want to access your MS Exchange account (e.g. with Entourage) from outside of the TU/e, or if you want to connect to the S drive or G drive, you need to connect using VPN. Your computer will become part of the TU/e network and receive a TU/e IP address. This is also useful if you want to search for literature. The TU/e IP address will give access to most publishers and libraries. Alternatively, you can use the new library proxy server. 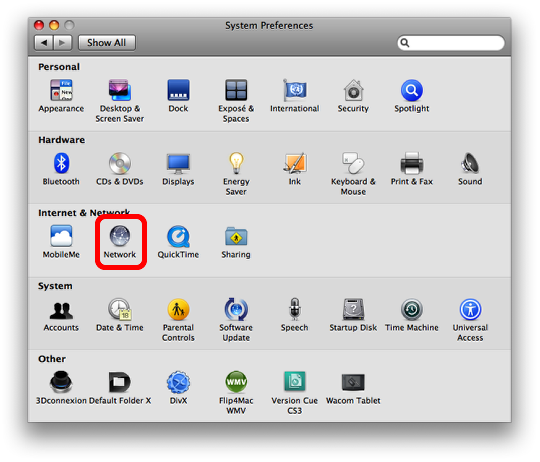 Open the system preferences and click on the “Network” icon. Add a new network interface by clicking on the “+” icon. 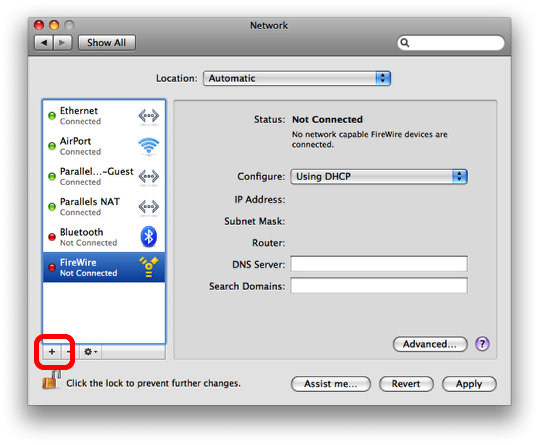 Select VPN for the interface and PPTP for the VPN type. You can give this service any name you want. You can now add the server address and your account name, which is your normal windows login name. 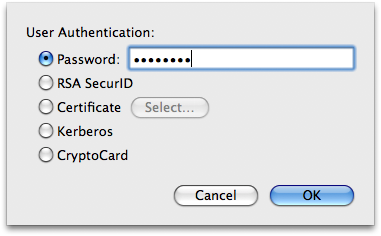 Choose “None” for encryption and select the authentication settings. You need to add your password. You can now click on “Connect” to start the VPN, but you can also check the “Show VPN status in menu bar” and activate the connection from there. Authentication settings also require a shared secret, or license for the machine authentication. Do you know what to put there? I use os 10.5.2 package, I assume it must be same with those displays but the authentication window has that extra box for machine authentication. I just couldn’t find the necessary info for TUe network. You only need your password when you use the PPTP method described above. I’ve followed all the steps, but it won’t let me connect. The ”connect” button is greyed out, so I can’t even click on it. I’ve entered all the information exactly as you’ve put it up here, so I have no idea what else to do. Could you give me some advice? is there a way to connect my mac to the W-drive(evidence drive)? @Murat: After adding connection data and password, you need to click the Apply button. Only then will the Connect button be enabled. It would be good if Christoph added this step to his description. 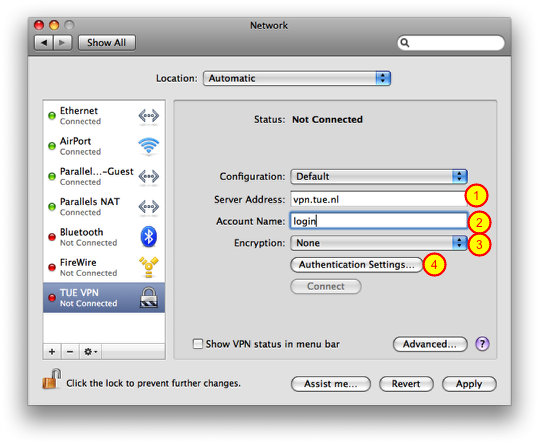 It seems that I can succesfully establish a VPN connection with TU/e (Snow Leopard). this and has anyone a solution? Verder is het probleem dat de computer uit VPN gaat als het display uit gaat. En weet er ook iemand een goede latex omgeving voor Snow Leopard? Try MacTex from http://www.tug.org/mactex/2009/. I use the TexShop GUI. What about VPN disconnecting when the the display goes down? Won’t work for me! Have set up the connection as described above, but when trying to connect I get this message it can’t connect every time! anyone with the same problem? of someone who knows how to solve this? Is er een manier waarop ik op mijn mac op de servers van TU/e kan komen? In windows typ ik bijvoorbeeld \\simonstevin in m’n verkenner om op de Simon server te komen, kan dit op mijn mac ook? @ MN: I had the same problem, but if you do not set your password in advance but just type it in when it asks for it, it works. Does not bother me, since I use it not very often. Hope that helps.